Tomorrow night unbeaten super bantamweight Scott Quigg defends his British belt for the first time since taking it from Jason Booth. Quigg (23-0) impressed the fans with a near perfect performance, building up a rivalry with fellow unbeaten Super Bantamweight Carl Frampton in the process. Even though there were no nasty words between Quigg and Frampton, Frampton’s manager Barry McGuigan and Quigg's trainer Joe Gallagher have had one or two sly digs. On the boxing show Ringside, Gallagher told McGuigan to stop making a name for his fighter by talking up a fight between him and Quigg. McGuigan reaction was to laugh along with the video and show respect for Scott Quigg and Joe Gallagher. Team Frampton come across as the more laid back of the two, which could suggest they are more confident of winning the fight. For that match to get made Quigg will have to get past Jamie Arthur, who shouldn't be taken for granted. Quigg is a big favourite, with Betfred having him at 1/28 and Arthur at 10/1, but any risk takers out there could stick a few quid on Arthur. That said, the only way I see Arthur (18-5) winning is if Quigg doesn't take him seriously, but Quigg is no idiot and he has a smart team around him with Joe Gallagher and Ricky Hatton. Expect him to break down Arthur and stop him in the same style he did Jason Booth. With Quigg a big betting favourite, and rival Carl Frampton putting in a top performance last weekend, Quigg will feel pressure to win the fight and look as impressive as his rival. If he doesn’t wow the fans like Frampton did, more fans will leave the Scott Quigg Express and board the Carl Frampton hype train. Evan assuming he wins I don't think he will fight Frampton this year. Team Frampton seem more willing to make the fight than Quigg's, but that’s not to say he is avoiding Carl Frampton, more that Quigg's team want the fight further down the line when a bigger title is at stake and more fans are down with it. I can see Quigg taking on Rendall Munroe next and Frampton going for Kiko Martinez's European belt. For now I’d tell you to enjoy Quigg and Frampton fighting other guys and looking good, and in a years time we'll see Scott Quigg vs Carl Frampton. 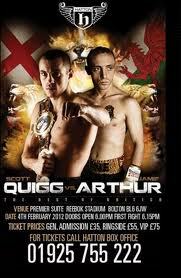 Tune into Sky Sports 1 on Saturday night Scott Quigg vs Jamie Arthur.